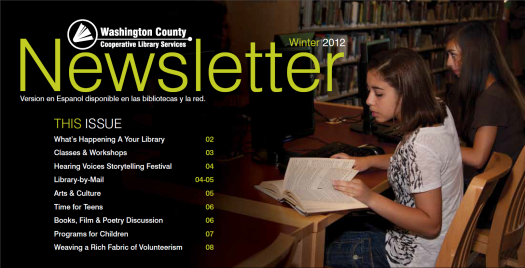 Highlights include information about WCCLS' RFID conversion project, a preview of the great storytellers coming to Washington Co. for our Hearing Voices program, and a spotlight on WCCLS' wonderful books by mail program for homebound folks. You can subscribe to receive this quarterly newsletter in your email inbox! To sign up for the English newsletter, click here and fill in the form at the bottom of the page. Visit this page to get the Spanish newsletter.